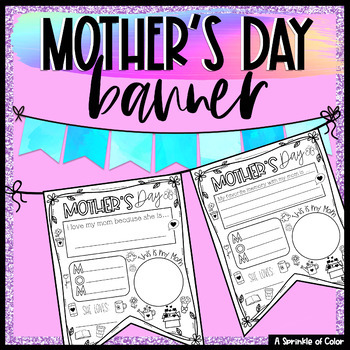 Mother's Day Banner Activity! 2 Pennant options: One for primary grades and another intermediate grades. → 1 Banner for Intermediate grades (3-6) that require more writing. → 1 Banner for Primary grades (K-3) that requires slightly less writing. Can be used for differentiation. ♥ Before Purchasing Check Out: Banners Growing Bundle and save 50%. ♥ Who is this for? → Recommended for Grades K-6. → Can be used in higher grades for funzies. → Teachers who want to add some fun decor to their classroom, while displaying student work. → EASY! Print, copy, and pass out (suggestion: choose “fit” as a printing option). → Students will need coloring pencils, markers, or crayons. → Fun activity for the season! → Can be used during Language Arts time because it includes writing. 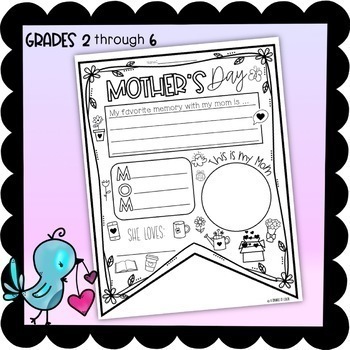 → Great for displaying student work! → The act of coloring can help improve motor skills in children. → No prep or extra materials needed. Just print, copy, and go! → Easy and effective way to bring art into the classroom. → Only in PDF form, not Google.